Some jet jockey owes me a beer. I was in the pattern with a student last week working on 180 degree power off accuracy approaches in preparation for his commercial checkride. It had started to rain fairly heavily a few minutes earlier, so it didn’t seem unusual to see a Lear 25 departing on runway 19R with a trail of water spray streaming from behind the main landing gear. But I still felt that something wasn’t right. So I kept watching. And sure enough, the spray of water from behind the jet only intensified after it lifted off. That’s odd. Then the gear came up, yet the long stream of water remained. I called the tower to tell them that the Learjet was venting fuel from the right tip tank. About four seconds later the Lear made a sharp right turn, the Boeing 757 on final started to climb, and a bevy of emergency vehicles appeared from out of nowhere with their lights flashing. For you conspiracy theorists out there, it was almost as if they knew an emergency was about to occur. The rate at which fuel was streaming out of that tank was impressive. We were at least a mile away and it looked like Mother Nature’s own fuel dump valve had opened up and God Himself was sucking the kerosene out with a straw. The fuel spray trailed for a quarter of a mile behind the Learjet as though the pilot had turned on the smoke system during an airshow. Kinda cool looking. It all ended happily, as these events almost always do. The Lear 25 made a safe landing, and the last I saw it was being refueled while the airport operations personnel searched the runway for the errant fuel cap. I wonder if they ever found it. The pilot probably felt like an idiot, but then we all have our stories. Yours truly once took off with the cowl plugs installed on a Skylane, an act that ensured I would never be the one to cast the first stone. Watching that Learjet dump fuel reminded me of an eventful flight to Europe in the summer of 2000. I was flying on a Boeing 777, the newest airliner in the skies. We’d had several mechanical delays due to problems with the airplane and took off from LAX a day late. Two hours into the flight we were somewhere over Idaho, as I recall, when another problem cropped up. Passengers in first class were feeling a strong vibration in the airframe. The first officer came back to check it out and determined that a small exterior door was loose. 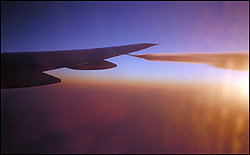 After consulting with United Airlines maintenance personnel in San Francisco, the crew opted to return to Los Angeles. Of course, with a full load of fuel, we were way too heavy to land. So the pilot started dumping fuel to lighten the load. The fuel dumping continued all the way back to LAX — nearly two hours. And when we landed, we were still far enough over maximum gross landing weight that the airplane was grounded until mechanics could confirm that the landing gear was not damaged. I managed to capture a few photos of the dumping in progress. The problem with that access door was well known to United. In fact, the entire 777 fleet had been retrofitted to remove the door permanently. All except one airplane — ours — which was due to have the mod done at the next maintenance interval. I only know all this because United Airlines allows passengers to listen in on radio communications via the headsets they provide. I think it’s channel 9. The crew probably would have disabled channel 9 if they’d remembered to do so. Luckily for me they forgot, and I got some free entertainment on the way back.